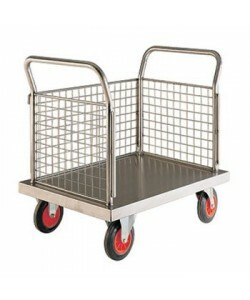 Offering a variety of platform trolleys and trucks, Fletcher European cater for a host of different industries. From retail, food manufacturing and engineering to textiles, waste and recycling, our platform trucks and trolleys provide hard wearing and stable methods for transporting goods. 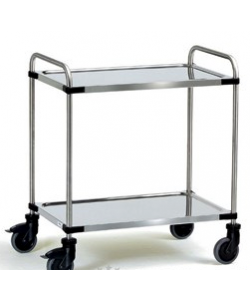 Within the range of platform trolleys we offer a number of different models of stainless steel platform trucks, coloured platform trolleys ideal for colour coded environments, plastic platform trolleys for saving on space and stainless steel shelf trolleys. With each of the different styles, numerous sizes are also available, helping to provide a platform truck that meets your requirements. Flaunting 304 grade stainless steel construction, the SP601M is a stainless steel platform truck designed for use within the food and drink industries as well as pharmaceuticals and other hygiene sensitive environments. 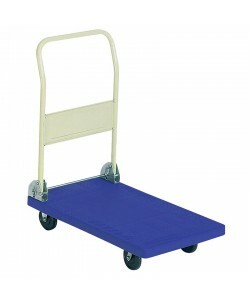 Easily cleaned, these platform trucks are incredibly durable and are rust and corrosion resistant. 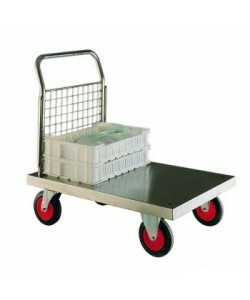 Fitted with rubber tyred wheels, the stainless steel platform trucks glide effortlessly across busy factory floors whilst creating little noise. Equipped with a handle and single end mesh side, the SP601M can be supplied in numerous other versions. The SP602M has handles and mesh sides at either end, the SP603M includes a third mesh side and the SP604M platform trucks are four sided. Each of the different models of stainless steel platform trucks is available in different sizes, from 600mm wide the platform trolleys can also be supplied in 700mm and 800mm widths. 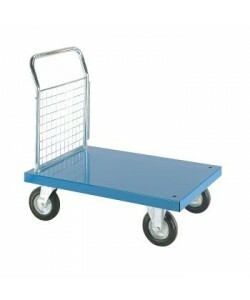 These larger sized platform trucks offer larger platforms for you to store and transport bigger items. With the 3 sided and 4 sided platform trucks, the side mesh panels can be removed at any time if required. 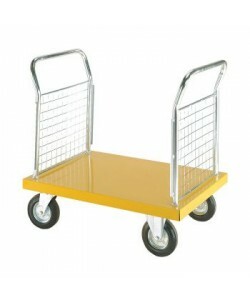 Following suit, we offer an economical version of platform trolleys with coloured bases. 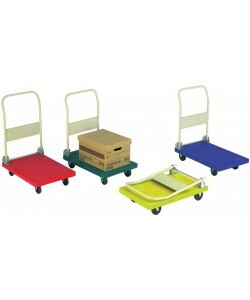 These coloured platform trucks are ideal for environments where stainless steel is not a requirement, for example retail stores or warehouses. 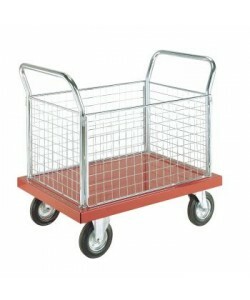 Available in four colours, red, blue, green and yellow, the EP601M, EP602M, EP603M and EP604M platform trolleys prove to be a cost effective means for easily transporting goods and products. Each has a powder coated coloured deck and is available with one, two, three or four sides, much like the stainless steel versions. Available in three different size options including 600mm, 700mm and 800mm widths, the coloured platform trolleys are equipped with rubber tyred wheels for noise reduction and can be fitted with braked castors and bumper strips if required. As with the stainless steel platform trucks, these coloured platform trolleys' bright zinc plated mesh sides are removable, allowing you to modify them to suit your application. 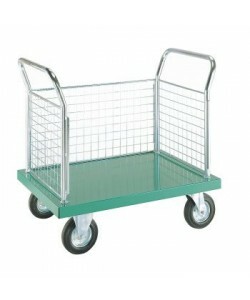 Continuing the range are our folding plastic platform trolleys. 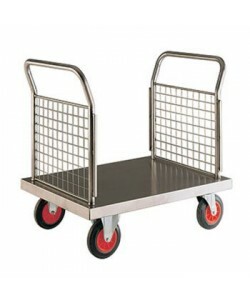 Ideally suited for light duty applications, these platform trolleys are often used within retail stores, supermarkets, offices, stock rooms and so on as store and distribution trolleys. Equipped with a folding handle to save on space when not in use, the PT02 and PT03 plastic platform trucks are highly manoeuvrable and ideal for handling light weight loads. 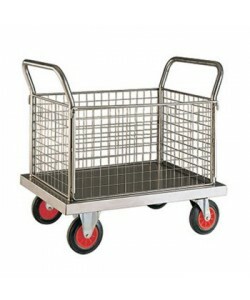 Another means for light weight storage and distribution are our stainless steel shelf trolleys. 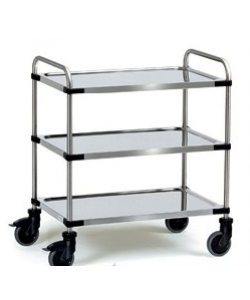 Designed for use within offices, stock rooms and food processing environments, these light weight trolleys are ideal for stock picking and are highly hygienic. Available in three sizes, the SSTY2, SSTY3 and SSTY4 are equipped with braked wheels and are easily manoeuvred.